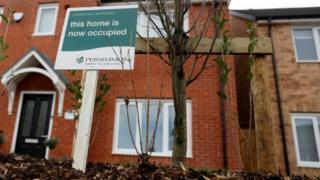 Shares in housebuilder Persimmon have fallen sharply after the company's continued participation in the Help to Buy scheme came under scrutiny. A source close to housing minister James Brokenshire said he was "increasingly concerned" by the company's practices. These included its use of leasehold contracts, the quality of its buildings and its leadership. The source also said any future government funding scheme would not support unjustified use of leaseholds for new houses. The housing sector has been criticised for practices such as selling houses with rising leasehold charges, which make them hard to sell on, and for poor quality workmanship. The leasehold system, most commonly used in flat ownership, sees property owners charged a ground rent by the owner of the lease, adding another cost to home ownership on top of the typical mortgage. It can also mean the leaseholder controlling maintenance costs. Shares in Persimmon were down by nearly 6% on Monday morning, and other housebuilders - including Barratt Developments, Taylor Wimpey and Berkeley - were also dragged lower. The minister's source said: "James has become increasingly concerned by the behaviour of Persimmon in the last 12 months. "Leasehold, build quality, their leadership seemingly not getting they're accountable to their customers, are all points that have been raised by the Secretary of State privately. "Given that contracts for the 2021 extension to Help to Buy are being reviewed shortly, which overall is a great scheme helping hundreds of thousands of people into home ownership, it would be surprising if Persimmon's approach wasn't a point of discussion." A spokesman for Persimmon said: "Our performance over recent years reflects the group's success in growing its construction volumes to meet UK housing need, particularly by offering attractively priced new homes to first-time buyers. "In late 2018 we announced a range of new customer service initiatives and we are confident that these will improve our performance once they have had time to take effect. We are also making a significant investment in training to address the shortage of skills in the industry." Analysts at Liberum said they would be very surprised if Persimmon was excluded from the next phase of the Help to Buy scheme. They noted that Persimmon is the biggest user of the scheme, and many of the issues are said to have been resolved. Late last year the company's boss, Jeff Fairburn, left the company following a row over his £75m pay award.